We are a husband and wife team who were painting similar subjects ... Australian history, horse art and landscapes ... long before we met. 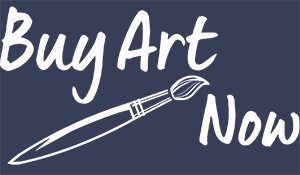 Having similar interests, we are in the delightful position of working together researching, designing, painting our artworks using oil paints and sometimes pastel then reproducing these beautiful Light Horse Horse art paintings as high quality giclee fine art prints on canvas. We hope that you enjoy the wonderful stories of the Australian Light Horse that these equestrian paintings portray. My first love was horses and I studied them and drew them from a very early age, and so my skills of observation and drawing developed. Later I had horses of my own and experienced the wonderful close relationship a human can have with a horse. A deep love of the Australian bush where I grew up, soon manifested itself in my landscapes. Later a fascination with our unique Australian history has combined with the love of the bush, horses and the country way of life, and developed into forays into painting aspects of that history. I grew up in the country where I developed a great love and appreciation of the Australian bush and rural life. I started my education at Upper Burringbar Public School, a 1-2 teacher school in Northern NSW and it was here that my talent was first recognized and I sold my first drawings and paintings. I attended Murwillumbah High School and was within the top 10 art students in the 1973 NSW Higher School Certificate, but chose to do a Dip.Ed. in General Primary Teaching at Northern Rivers College of Advanced Education in Lismore, (now the Southern Cross University) rather than go to Art School in Sydney, because I did not want to be forced to paint in a contemporary style. During this period I began selling works in local galleries under my maiden name of Jennifer Jowett. Ron and I had been painting similar subjects … early Australian history, landscapes, seascapes and working horses. Together we have embarked on a series of historical paintings about an old gold mining town called the “Mount Britton Collection” and in 2005 Ron decided he wanted to paint the Australian Light Horse, a subject I knew nothing about. We attended a Light Horse re-enactment and I was introduced to the remarkable true stories of these Australian horses and the men who rode them in World War One. 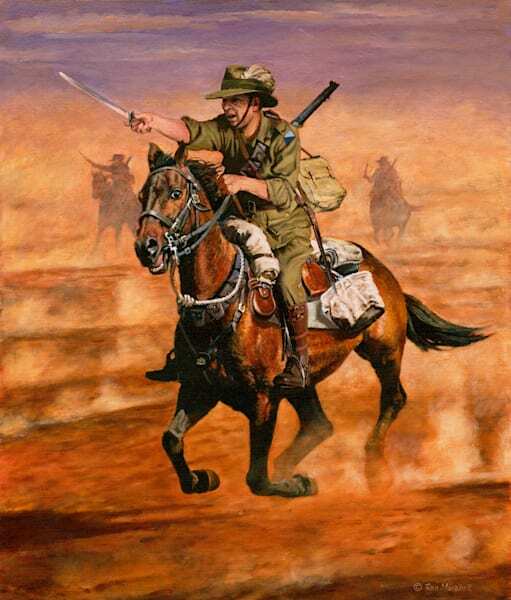 I felt I had to paint those stories and so began a lot of research and an amazing journey into our history and we have been painting the Australian Light Horse ever since, sharing some of those remarkable stories through our artwork. In 2006 we moved to the “Rose and Rodeo Capital of Queensland”, the lovely historic, country town of Warwick, where we have set up their studio. I am currently the secretary for the 11th Light Horse Warwick Troop, whose members have from time to time also conveniently posed as subject matter for some of our paintings. 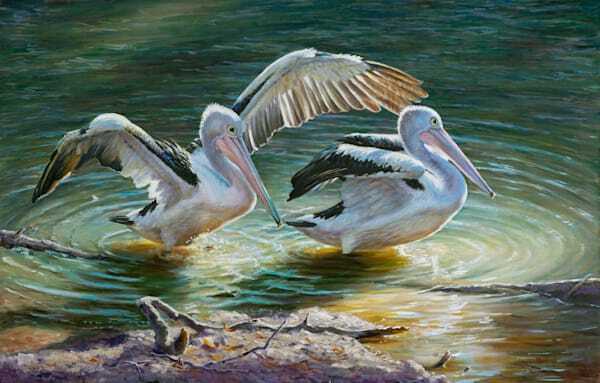 Ron Marshall, an Australian traditional, realist artist of considerable skill, was born in 1938 and grew up in Sydney. Because of his artistic skills he began his sign writers apprenticeship at the age of 14 years and 10 months. Ron was always experimenting to find new and better ways to achieve the results he sought, and some of his discoveries soon became normal practice in the trade. Ron was much respected in the sign trade for his high standard of workmanship and artistic skills. It wasn't long before Ron turned his attention to fine art. He associated or painted with such well-known traditional landscape artists as Doug Sealy, Les Graham and Robert Wilson. 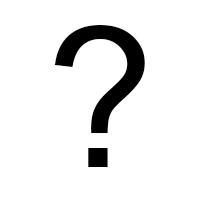 He earned the nickname of "Rainmaker" because it always seemed to rain whenever he came with them on a camping trip on which they intended to paint on site. Ron was fascinated by the techniques of the Old Masters, such as Rubens and Rembrandt, and studied their methods, used the same materials, and experimented with their techniques. During this stage he produced numerous copies of these masterpieces. He continued in the sign writing trade for over 40 years until retiring for health reasons in 1995 when he moved to Mackay, Queensland and began thinking about doing some serious painting. He met Jennifer Jowett in a local gallery, together they won the Mackay Airport Mural Competition in 1996, and were married in 2000. 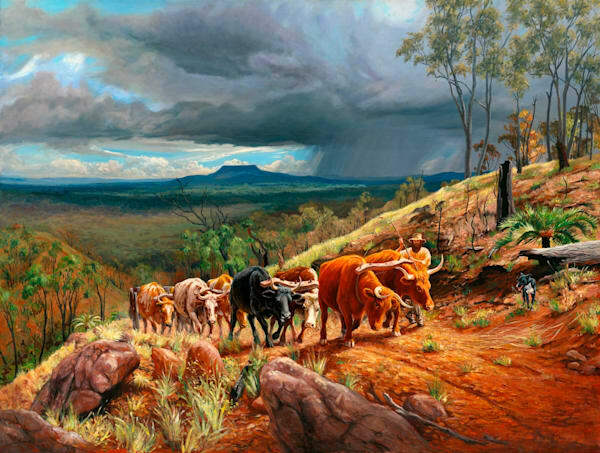 Since then they have combined their interest in local Australian history, landscape and horses in their Mount Britton Collection of paintings. In 2006 they and moved to the southern Queensland town of Warwick. Now Ron uses what he calls the "Mixed Technique", using acrylics, alkyds and oils. To this day he is still experimenting with paint in order to achieve the effects he wants. Ron, has combined his interest in horses and Australian Military heritage and is currently working on a series of “The Australian Light Horse” with Jennifer. Prints of theseartworks have found their way into collections from the USA to Israel. 2003 “The Mount Britton Collection” Nebo Shire Museum Courthouse Gallery -permanent exhibition. From 1977 until 1987 I lived in several different central NSW locations, exhibiting my work in local galleries and country NSW exhibitions, winning numerous awards, including many Peoples Popular Choice Awards. From 1988 until 2006 I lived in the Mackay region, again exhibiting locally and winning many awards including Open, Representational, Traditional, Pastel, Portrait, and Peoples Popular Choice Awards. In 1994 and 1995 I tutored pastel classes at James Cook University’s Mackay Campus. In 2000 I married fellow artist Ron Marshall with whom I had won the Mackay Airport Mural Competition in 1996. (These murals now hang at Mackay Tourism Information Centre.) From then I painted under my married name of Jennifer Marshall. 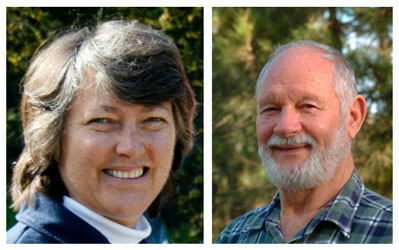 Visit Ron and Jennifer's website here.